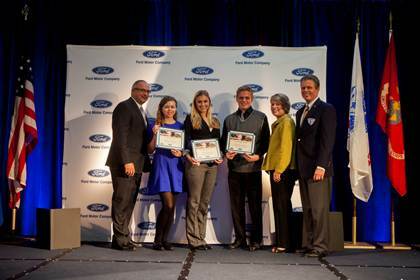 Ford Fund awarded $57,000 in scholarships to 50 high school students in San Diego who have parents in active service in the military. Winners of Operation Education scholarships were announced on Dec. 4 at a ceremony aboard the USS Midway. With support from the contest administrator, the Society of Manufacturing Engineers Education Foundation, student winners have been selected based on essays that answer this question: What have you learned from having a family member in the service, and how has this impacted your goals and plans for the future? A $5,000 Blue Oval Scholarship will be awarded to the first-place winner. Second- and third-place winners will receive a scholarship of $2,500 each, and the remaining 47 winners will receive a scholarship of $1,000 each. The scholarship will be paid directly to the college or university in which the winner is enrolled. Ford Motor Company Fund and Community Services works with community partners to advance driving safety, education and community life. The Ford Motor Company Fund has operated for more than 60 years with ongoing funding from Ford Motor Company. The award-winning Ford Driving Skills for Life program teaches new drivers through a variety of hands-on and interactive methods. Innovation in education is encouraged through national programs that enhance high school learning and provide college scholarships and university grants. Through the Ford Volunteer Corps, more than 25,000 Ford employees and retirees each year work on projects that better their communities in more than 20 countries. For more information, visit http://community.ford.com. Who is the Secret Service?